Oculus Rift? Microsoft HoloLens? Samsung Gear? Nah, who needs those? 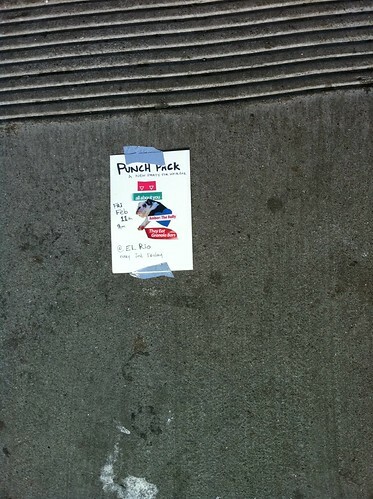 Old school red/blue 3D is where it’s at, as this somewhat illegally placed ad goes to show. 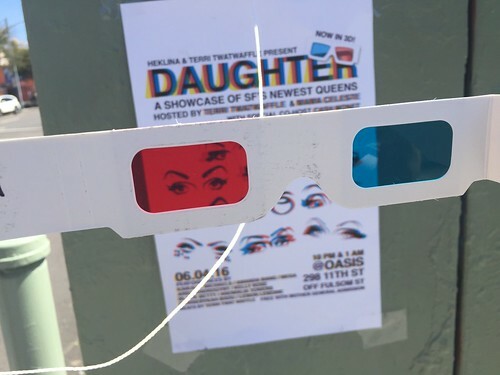 Before you ask, yes — I put on the 3D glasses and tested it out. While the 3D effect does work on this ad, unfortunately it barely makes use of the medium. What a shame. I’d love to see a similar “stunt” 3D advertisement that fully took advantage of the format. Maybe a secret phrase that jumps out at you that gets you something in return, like 10% off drinks or discounted entry to a club? Hey I’m just making suggestions here. Get on it, guerilla advertisers. Hold on here. 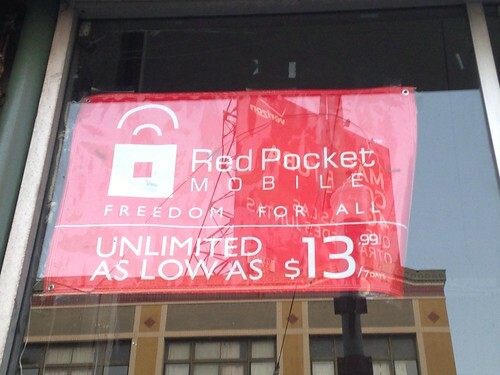 Unlimited mobile phone service for a tiny fraction of what I’m paying now? That sounds too good to be true. 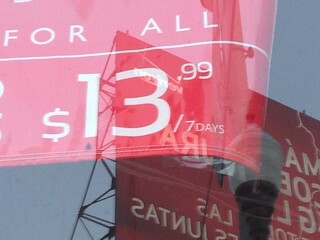 $13.99 per week is what us normal people call “$60 per month.” Suddenly that amazing deal doesn’t sound so amazing, does it? 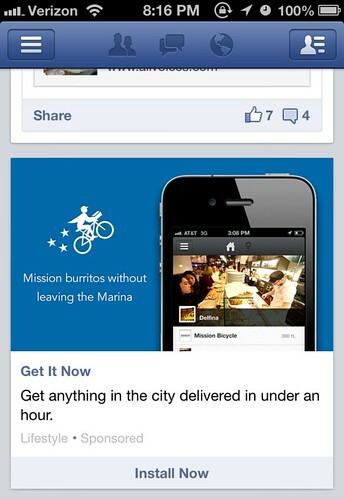 …wait, they think I want Mission burritos delivered to the Marina? I mean, they’re right about me being lazy enough to get a burrito delivered instead of walking three blocks, but the Marina? Come on. San Francisco is a city of people who are indecisive and disagreeable. We even manage to disagree about really basic things, to the point where basic issues like panhandling and slow public transportation go unsolved for decades. But when corporations use litter and graffiti as a form of advertising, San Franciscans have a rare moment of clarity and unity. The same way we’re against fighting for oil in the middle east, we’re willing to hold protests and call in the national guard over advertising agencies stenciling our sidewalks. We didn’t stand for Levi’s or Microsoft spray-painting our sidewalks. Today, we won’t stand for HP littering the city either. 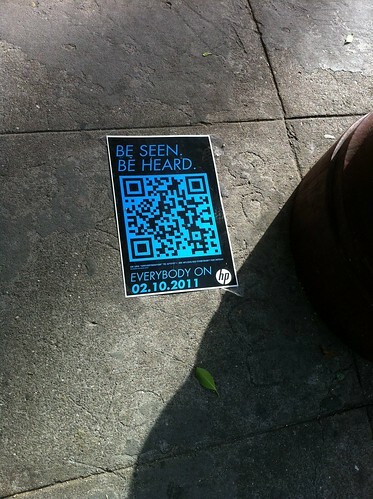 They’ve put QR code posters up on the sidewalks and on street poles all over the Mission. 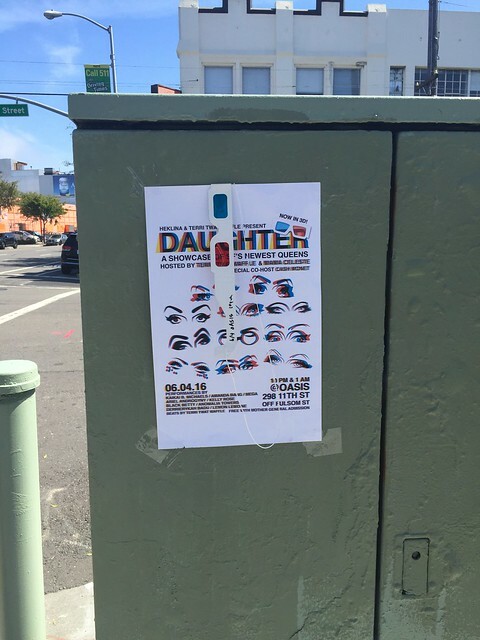 Why are San Franciscans against sidewalk advertising? Well, first of all, public space is for the people, not for corporations. A coffee stand at the park? NO! A taco truck on the street outside Best Buy? NO! Oh wait a sec, those tacos are delicious. You know what? Never mind. We’ll discuss this later… OM NOM NOM. Second, corporate advertising on public property offends our artistic sensibilities. Public art is fine with San Franciscans, and even though we can’t agree on whether or not graffiti is art, we can agree that corporate graffiti is NOT art. Art isn’t supposed to be an expression of greed unless you’re really ironic about it, like Andy Warhol or the guy who makes OBEY merchandise. Now, every rule as its exceptions, and I found one down the street from the offensive HP sidewalk pollution. I think it’s safe to say that a handmade flier taped to the sidewalk advertising a party at El Rio is an exception to our “no sidewalk advertising” rule. Because, well, we make exceptions for things we enjoy — like tacos. I’ve been noticing some strange ads lately for a company called Bell Plumbing North here in San Francisco. Their ad is one major WTF after another. So there’s a smiling guy with the word PLUMBING in big red letters next to him. Not so strange… or is it? Yes, that’s a phone. It’s an ad for plumbing, and he’s holding a phone. Not a pipe; a PHONE. What does a phone have to do with plumbing? Everybody knows you can call a plumber on a phone, you don’t need this concept presented visually. But it gets stranger — look at his shirt. 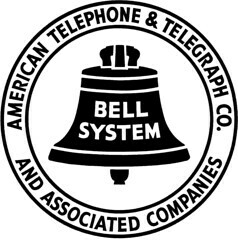 But wait… that’s the logo for Bell Telephone. The guy in the ad is wearing a phone company uniform. Does he work for the phone company during the day, and moonlight as a plumber at night? Or perhaps he’s the customer. He’s a phone operator, and the men’s room at the phone company is flooding, so he’s calling a plumber. No explanation could possibly be satisfactory. Lastly, let’s look at where this company advertises. Yes… that’s the front cover of a phone book. 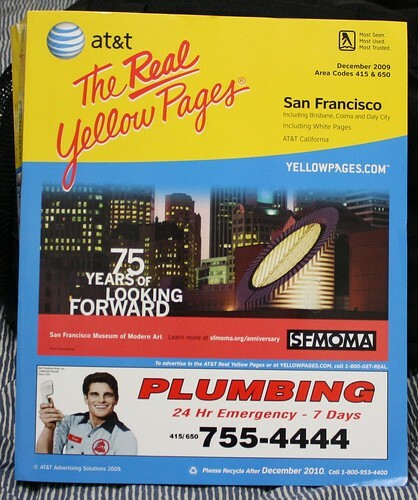 They advertise on the PHONE BOOK. Phones… plumbing? Huh? Where’s the connection? If they were a company that sold phones I would get it. But now I’m more confused than ever, and the circle of insanity is complete.